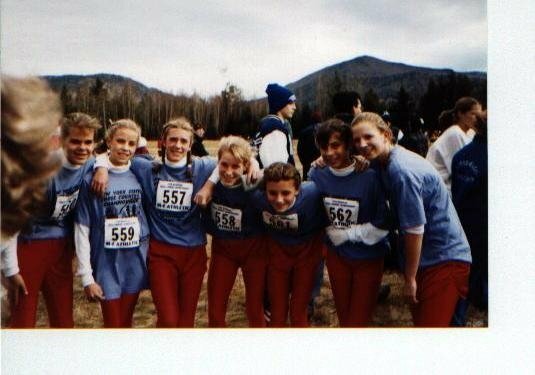 One fall day, all the way back in 1999, a handful or so of girls, including myself, showed up to Penfield high school donning formal black clothing. Given we weren't the goth type, we were repeatedly asked one question throughout the day-"are you going to a funeral?" Yes," we'd respond. "Whose?" I can't. "Huh? You can't? You can't say? What?" No. I can't. At this point, the conversation would generally stop, and the rest of the high school population would have further proof that the cross country girls were, in fact, sort of weird. I don't know who came up with the idea-probably Courtney or Leah, since they were the creative brains behind us in those years. But the concept was simple, yet somehow genius. The end of the season was approaching (I can't remember exactly when we did this, but it doesn't matter), and we were all finding ways in which to doubt ourselves as the important final meets loomed. We needed to somehow rid ourselves of these doubts-so we'd do it quite literally. We'd hold a funeral for our "I can'ts" The "I can'ts" could be anything-place-related, time-related, or, most importantly, mental outlook-related. We'd all write down our doubts, dress up in black for school, and meet before practice at our home course. From there, we'd take turns reading a eulogy to our I can'ts, and then we'd ceremoniously put them in a box, and all take turns digging a hole for that box, and tuck them away in the woods at Harris Whalen Park forever. From that point on, we weren't allowed to utter those words anymore, and if we expressed our doubts, well, we'd just remind ourselves that they were gone. We could. I have no idea what my "I can'ts" were at the time. Probably things such as "I can't break 20min", "I can't finish top 10 at sectionals", "I can't outkick someone", "I can't not get passed on uphills", or "I can't keep focused in the second mile". And although it might not have been that year, well, I did do all of those things. Every year from that point on, we repeated the funeral at some point late in the season, just before those crucial races. So what does it mean now? I started thinking of the "I can't" funeral recently. I had reached a point where I was finding myself a bit frustrated in the pool and on the bike. My rational self knew that at the end of a very tough three week block, I'd be struggling to hit some of the numbers I'd seen at the start. My irrational self was starting to project this onto IM Texas, and I was starting to really wonder if I could do what I want to there. So maybe I need to revisit the concept of that "I can't" funeral. Because I don't have teammates to dress up in black and dig holes with, I'm going to use this post as my own, personal, grown-up I can't funeral. In no particular order, then, here's my "I can'ts" for IM Texas. Writing them out doesn't mean that I will do all these things, it just means that if I don't do them, it won't be because I didn't believe that I could. With that, here's all the doubts I'm going to spend the next (less than) week burying inside of me. I can't make the swim group I should be in. I can't swim under 65min. I can't hold higher wattage than I did in Florida last year. I can't manage bottle handoffs well enough to get in all the fluid I'll need. I can't get off the bike ahead of someone who's a faster runner than I am, and still hold them off. I can't handle my normal run paces in the heat. I can't come out on top in a close finish. I can't make it onto the awards stand again. I can't avoid slowing way down the final 10k of the run. I can't feel strong and comfortable on the bike. I can't keep up up/down hills on the bike. I can't keep my cadence up in aero. I can't keep positive and focused throughout the entire swim and bike; I can't keep up with the others on them, either. I can't execute the race I should have based on the work I've put in, which is more than what I've done in the past.